1. Under Article 7 of the Framework Directive we are required, following completion of the domestic consultation process, to notify the European Commission, BEREC, and other national regulatory authorities, of our final proposals. There is a one-month period for these organisations to provide their comments to us. 2. Ofcom estimates suggest that reusing existing infrastructure enables significant cost savings, reducing the average cost per home passed in some cases by up to 50%. Given ongoing costs, including rental charges for duct and poles access, the reduction in total lifetime costs is lower, though substantial. 4. Until now, BT’s ability to raise wholesale charges for superfast broadband has been constrained by people’s willingness to buy cheaper, standard ‘copper’ broadband as an alternative. However, this constraint is weakening, as people increasingly need faster, more reliable connections. 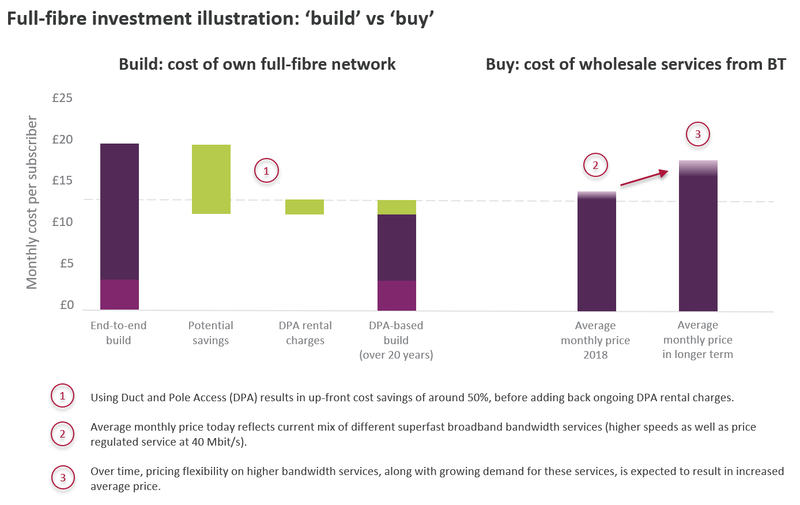 Standard broadband delivered over Openreach’s existing copper network has long been subject to a wholesale charge control, and this will continue over the coming years, with the price remaining broadly stable. Both the ‘up to 40 Mbit/s’ service and the copper access service are required to provide retail superfast broadband services. 5. Quality of service targets will take account of external factors beyond Openreach's reasonable control, such as extreme weather. The targets will allow that up to 3% of repairs, and 1% of installations in a typical year, might be delayed by such factors.